Hello blog friends. 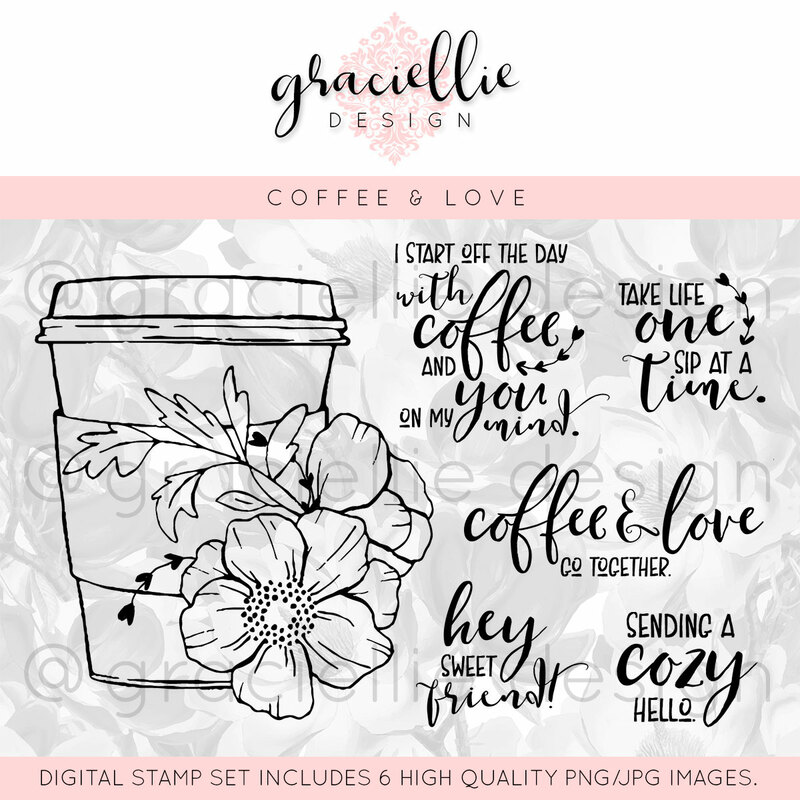 Today I'm sharing a mini coffee themed set created with Graciellie's new "Coffee and Love" digital stamp set. 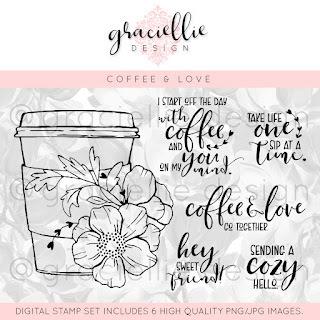 Graciellie Designs is excited to collaborate with the Coffee Loving Cardmakers to share some fun coffee-themed projects with you. 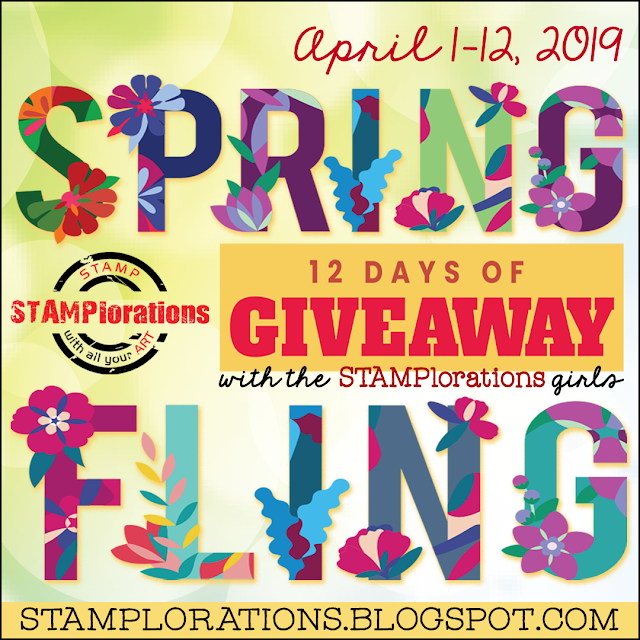 for the complete blog hop list. Winners will be announced February 17th. Scroll to the bottom of this post to see where you need to head next. ...a mini post it note holder and a handful of coffee flavored candy! I used a free tutorial (that I found on Pinterest) from Silvey's Craftroom to create my mini bag from one piece of 8 1/2 x 11 kraft cardstock. I printed off some images from Graciellie's New Coffee and Love digital set onto watercolor paper. Next, I colored them with prismacolor pencils, blended with a colorless blender pen, and added highlights with watercolor markers. I used two different Chilipapers sets to decorated both the bag and mini post it note holder. For the final touch, I added pearls to the center of my flowers and popped a few of them up with mounting tape for added dimension. Click here to go to your next stop -- HELEN GULLETT AT LIVING MY GIVEN LIFE. How special and perfect! I am so inspired by this project idea. Thank you so much Esther for sharing this gorgeous set! I love the entire concept of this make! Gorgeous. WOW! Love your gorgeous gift set! That one sheet gift bag is an awesome idea! I would love to receive this gorgeous yumminess! Lovely gift idea! great outside and delicious inside! Esther... LOVE your good bag and box!!! They are beautiful and lovely. I love those extra flowers, too. Thank you so much the inspiration! The sentiments in this digi stamp set are so useful. I like what you did with them. Oh my...what a gorgeous gift set, Esther!! So pretty! Oh my goodness!! I love this!! Pretty paper and such an amazing gift idea! A lovely gift set Esther! What a sweet sweet lovely gift idea - love your creation here and the brown tones used - great work as always TFS and for the hop! wow, what a beautiful set! Awesome gift idea!! Thanks for sharing. Such a fun find for this Pinspired project. Love the design and the krafty color scheme is yummy! What a lovely coffee themed gift set you have created. Love how creative this gift set is. love your creations, so beautiful! What a fun and pretty gift set! Your gift set is beautiful. Thanks for sharing. What a beautiful gift box - and love the images you used. What a beautiful set! Love all the details! Such beautiful projects! Great job! I am loving this coffee stamp set. Your project is super! TFS! A fabulous gift set using this gorgeous image. Just beautiful! This gifts set is off-the-chart! Absolutely love what you did here!